Do you have what it takes to steal the most treasure from the fearsome dragon? You can find out in Hoard, a quick playing family card game designed by Cheeky Parrot Games and currently being funded on Kickstarter. In Hoard, 2-6 adventurers race to collect and claim sets of treasures by exploring the dragon's cave. Be careful though! Some cards can disturb the dragon, and if he wakes up you'll be forced to flee with only the treasures you've claimed so far. Adventurers will need a combination of strategy, memory, and luck to succeed on their quest. 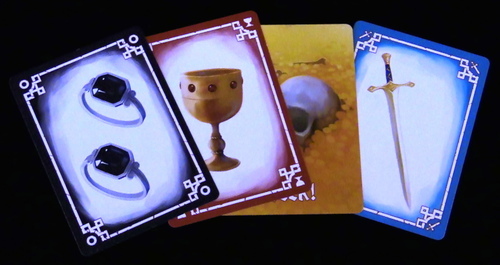 Each game of Hoard is played over multiple rounds. The best adventurers in each round are awarded points, and the adventurer who earns 5 or more points first wins the game. Each round starts with the dragon fully asleep in the centre, surrounded by facedown cards. Each player chooses a card to start on, and gets to look at that card and place their pawn there. Everyone also starts with a hand of 5 cards. The goal of each round is to have the most points by the time the round ends. Players earn points for the treasures they've claimed, as well as sword and shield pairs in front of them and cards they've played to affect the dragon, and lose points for treasures left in their hand. 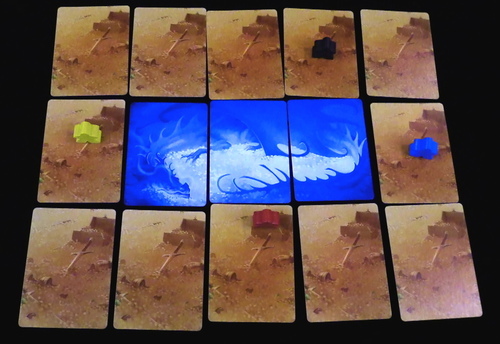 On their turn, a player can choose to move around the dragon's hoard and collect more cards. To move, the player rolls a dice and moves their pawn that many spaces in either direction. They get to look at the card they land on and choose to either add it to their hand (replacing it with a different card from their hand or the top of the deck), or to put the card back and take the top card of the deck instead. Instead of moving, a player can choose to play cards from their hand: treasures, dragon actions, or a sword or shield. Only one type of treasure can be played at a time, and you have to play at least 3 treasures of the same colour to start a set or at least 2 to add to a set if you've already placed that type earlier in the round (the cards that show two treasures count as two). Treasure chests can be used as any type of treasure, but will also partly wake the dragon when played. Every treasure in front of you counts as one point at the end of the round, and every treasure left in your hand loses you a point. Dragon action cards will disturb or soothe the dragon. If a player uses an “Eeek!” card, part of the dragon wakes up and is flipped over to the red side – if the dragon is now fully awake then the round ends immediately! A “Shhh!” card will put part of the dragon back to sleep by flipping a card back to its blue side. If a player manages to use exactly three dragon cards during a round, then they earn a bonus 5 points. Finally, sword cards can be played to attack another player, allowing you to take one of their cards, give them a card, or force a swap. Shield cards can be played to defend against attacks, to pair with a sword the player already has in front of them or to steal someone else's already played sword. Each sword and shield pair is worth one point at the end of the round. The round also ends if a player uses all of the cards in their hand, giving each other player one extra turn. Once the round ends everyone adds up their points and the person with the highest total earns 2 points, while the person in second place earns 1 point. If someone has reached a total of 5 points, then they are the best adventurer and win the game! Otherwise the game is set up to start another round. Hoard has been an absolute hit with me and with every group I've played it with, from casual gamers to people who usually prefer heavy complex games. It's easy to learn, plays quickly, and has a good balance of luck and strategy in the gameplay. Every round, players need to balance gaining more treasure cards with playing treasure cards for points. You can decide to push your luck and try to gather larger sets of treasures to play, but if you're too greedy then you risk the dragon waking up while you still have a hand full of points that you haven't had a chance to claim. You could also choose to play it safe and play down sets of treasures as you find them, but you risk not having enough treasures to win the round at the end. A lot of the strategy in Hoard lies in figuring out what your opponents are trying to do in order to stay one step ahead. For example, if another player is trying to wake up the dragon you might try to put it back to sleep. If someone is trying to empty their hand you could use a sword to pass them a card they can't easily use. It's also possible to figure out what your opponents are trying to collect by moving onto cards they have rejected or put back from their hand, so you can know which sets of treasure will be the easiest for you to find in the dragon's Hoard. 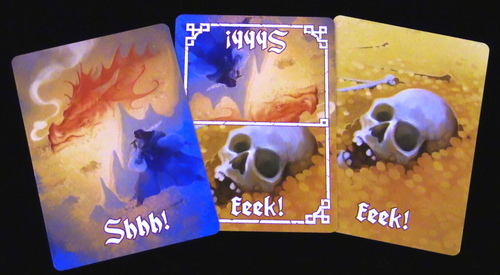 Hoard also has gorgeous art, and I really enjoyed the interactivity of the flipping dragon cards as the players disturb it or shush it back to sleep. It's a small detail that definitely added to the fun of the game, as you always have to be careful of other players waking up the dragon before you're ready. Whenever someone plays an “Eeek!” card or claims a treasure chest, the round becomes a little bit more tense as everyone has to rush to claim their treasures before the dragon fully wakes up. I really enjoyed being able to manipulate when the round will end because it meant that everyone always had to be watching what the other players were doing. It definitely added to the social aspect of the game, and made each round play very differently depending on what players drew in their starting hands. The only thing I didn't like about Hoard was that sometimes the rounds can end very quickly from people getting a lucky starting hand of almost complete sets of treasure and being able to get rid of all their cards in only a couple of turns. In the rounds where this happened, there wasn't much the other players could do to earn points before the round ended. This might frustrate some players who aren't able to do much during the round or who dislike the luck of the draw being able to impact the game so much. It only happened occasionally, but it did mean that players tended to try to empty their hand as soon as possible every round rather than spending time gathering treasure just in case someone got lucky with their starting hand and would end the game soon. If you do find the rounds are too short, I played a couple of games with an alternative rule that emptying your hand wouldn't end the round. This helped each round go for slightly longer each time, as players needed to fully wake the dragon or empty the deck, and still had the tension of whether to continue collecting or to play treasures based on the state of the dragon. If a player is unlucky enough to not draw any treasure chests or dragon cards with this rule then they wouldn't have much control over when the round ends, but it is a possible alternative for people who find the rounds ending too soon. There is also a bit of luck in what cards you land on and draw during the game, but I found there was more than enough strategy for me to enjoy it. If you are looking for a game where you can plan all your moves ahead of time then the luck in Hoard might frustrate you, but the interesting choices and quick gameplay meant that I had a great time playing it. I think Hoard is a “gem” of a game (if you'll excuse the pun), and I definitely recommend that you check it out on Kickstarter and consider lending it your support. Hoard has a surprising amount of strategy packed into such a small game, with lots of replayability and really fun dynamics between players as they race each other to collect treasure. The swords in the game also let players have conflicts without feeling aggressive or unfair. Hoard is a fantastic game for both families and regular gamers, as it is easy for younger players to learn and enjoy while offering interesting and fun gameplay for adults. It's a small, light game with a lot to offer and beautiful art on top of that. If you're interested in the game, the Kickstarter campaign is only live for another day so make sure to have a look at it!